South Korea captured a world title in women’s hockey on home ice on Saturday. 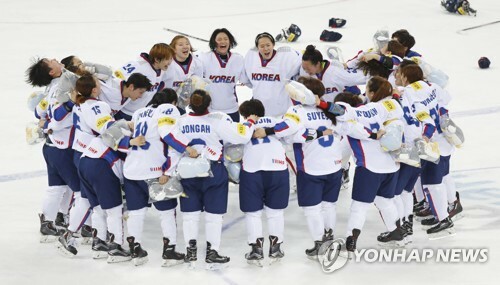 South Korea defeated the Netherlands 2-0 in an intense battle to win the International Ice Hockey Federation (IIHF) Women’s World Championship Division II Group A at Kwandong Hockey Centre in Gangneung, Gangwon Province. Forward Han Soo-jin scored both goals, as the host had a perfect record with five consecutive victories. South Korea earlier took down Slovenia, Britain, Australia and North Korea in succession. This is the fourth-highest level of the IIHF World Championships, and South Korea will be promoted to Division I Group B for the first time at the next championships. It earned a promotion from Division II Group B in 2013. Coached by Canadian Sarah Murray, South Korea ran the table by scoring the tournament-high 21 goals and giving up the tournament-low three goals in five games. South Korea never trailed in the tournament. South Korea netted nine power-play goals in 27 chances for the tournament-best 33.33 percent success rate. It is also the only team to go perfect in penalty kills, as it kept its opponents off the board in 13 such opportunities. The Netherlands came into the competition at No. 19 in the world, the highest among six participants here and four spots above South Korea. The Dutch looked shaky on both ends in their earlier victories, but looked much stronger in the early moments of this game. The Netherlands set up a strong forechecking from the opening puck drop and caused several South Korean turnovers deep in the offensive zone. Flustered in the early part of the game, South Korea tried to turn the tide on a five-on-three power-play opportunity late in the opening period, but Park Jong-ah and Randi Griffin each fanned on a loose puck lying near the crease with the goalie Lisa Daams out of position. After the scoreless first period, Han Soo-jin put South Korea on the board at 16:04 in the second. Defenseman Cho Mi-hwan threw the puck toward the net through traffic, and Park Jong-ah got a stick on the rebound before Han shot finished the job. South Korea got a power-play goal waved off at 1:15 in the third period, when Park Jong-ah kicked the puck into the open net. But the host scored the one that counted just 1:38 later, as Park fed Han from behind the net for a one-timer on the left wing. South Korea caught a break when Julie Zwarthoed rang one off the crossbar just a few minutes later, and the Netherlands failed to keep the pressure on the rest of the way. Shin So-jung, the usual No. 1 goalie who missed the four previous games with a knee injury, made 11 saves for the shutout. Han, with two goals Saturday, was named the game’s best player for South Korea. For the tournament, Han Do-hee, who filled in for Shin in the first four games and had a shutout against North Korea, was selected as South Korea’s top player for the tournament.